The word “penny” in a penny board stands for tiny. 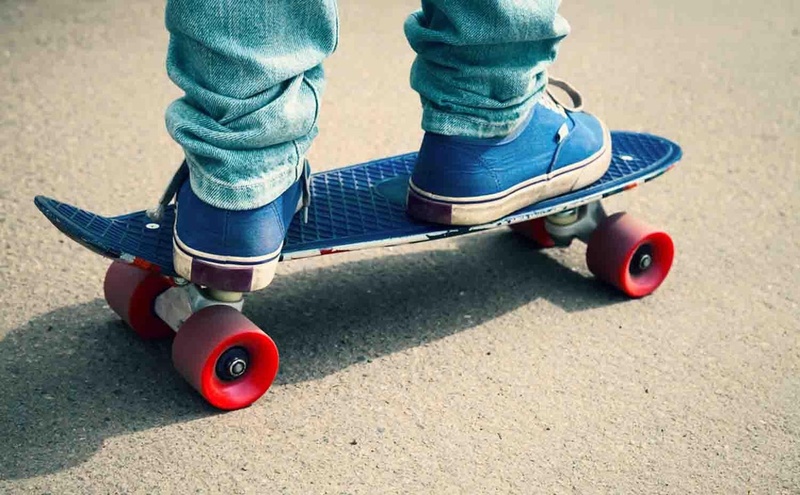 Penny board is actually a smaller version of a longboard (cruiser shape) with a plastic or wooden deck and a kick tail, metal trucks and large, quiet rubber wheels – quite like a longboard. Penny skateboards are popular for their small size, high speed, they are easy to transport and ideal for cities. Plastic penny board are a stylish 70s inspired fashion accessory. 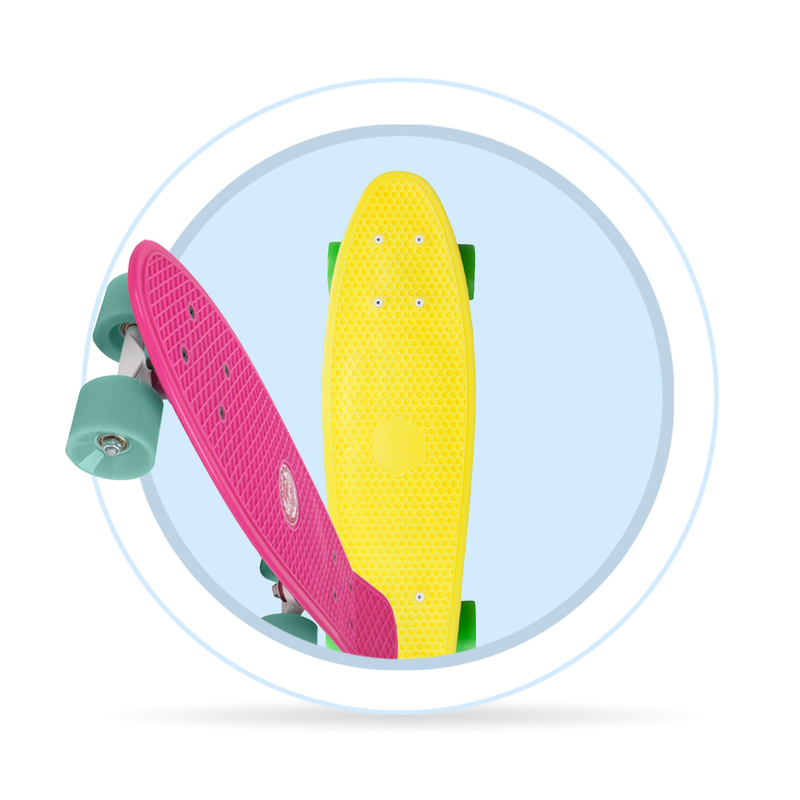 Penny boards have all similar sizes, however they differ greatly in the colourful design of the deck, in their wheels, brand, and price. Generally, the higher the price, the higher quality of the materials, production, graphic design, LED lights on the deck or the wheels. Are penny boards suitable for beginners? Which penny board is the best for a beginner? There are two main questions: 1) What is suitable for a beginner? and 2) What is suitable and affordable at the same time? Ad 1) Only the best and professional quality for beginners. There is no reason to ride cheap. Ad 2) If you aim for an affordable model, cheaper boards are sufficient for learning. There are no penny boards designed especially for beginners. Generally speaking, the longer is the deck, the more stable the ride is and therefore is more suitable for beginners. Standard popular deck size is 22” (56 cm). 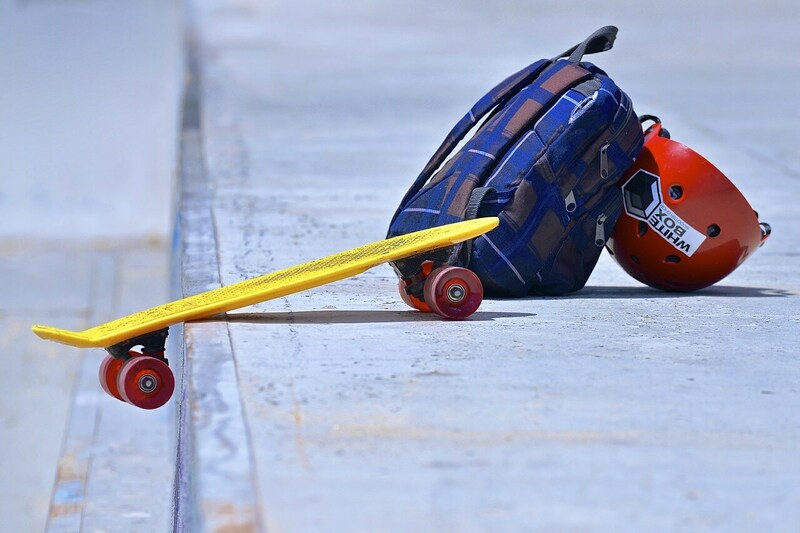 Penny boards are popular for their small size and high speed. They are great to ride despite their size. They excel with their low weight and compact dimensions. It is super easy to transport, it can fit into a backpack, on a backpack, school locker, and is easy to travel with. 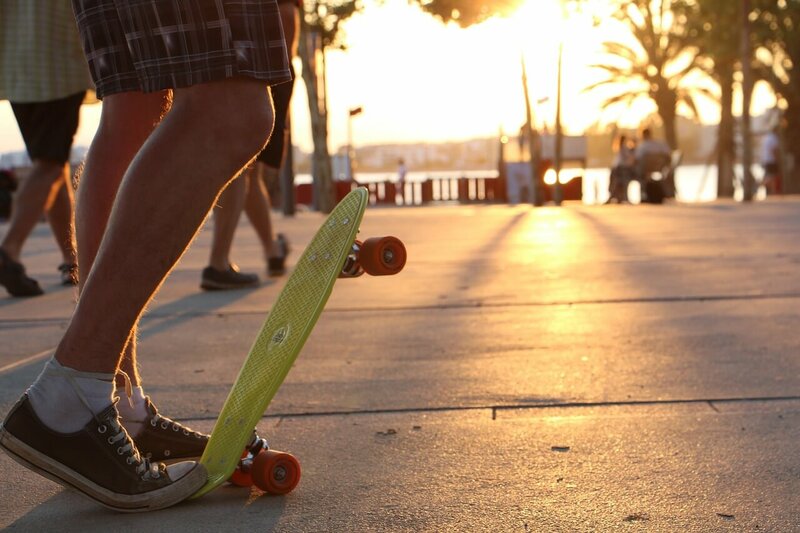 Thanks to its plastic deck penny boards maintain their low weight and are easy to care for. You should also focus on the wheel size. The larger the wheels, the better. Larger wheels are faster and they easily ride on uneven surface such as gravel or tiles. Larger wheels however also signify higher price. Softer wheels ride more comfortably, quietly, have a good grip on uneven surface, but on the other hand they are prone to small sharp stones. Harder wheels (80A+) are suitable for rather aggressive ride, sliding, dancing etc. The weight of the skateboarder has a huge influence on making turns. The bushings’ hardness and shape impacts the way the penny board is turning. Sometime loosening the bushings might be a solution, however sometimes it might not be enough and the bushings should be replaced for softer models. Deck is usually made of plastic and includes a tail. Tail is a slightly lifted rear part of the deck. Watch out for the material quality, a deck too hard might break easily and a too soft deck will bend and won’t provide enough stability. The capacity ranges from 80 to 100 kg. Regarding the shape, some decks are straight, some are arched, some have holes in them and some don’t. Plastic decks usually contain an anti-slip surface, stick-on griptapes are also a possibility. Trucks are metal pieces with a polyurethane case – bushings. Bushing enables turning, influences stability of the ride. Some penny boards come with harder bushings which result in smaller turns. Everything however depends on your style of riding. Smaller riders (under 40 kg) might have issues in turns, and if that is your case, you might want to opt for softer bushings. Wheels of larger dimensions (60 mm) made of soft polyurethane rubber or PVC. Wheels and bearings influence riding properties. Larger wheels have slower take-off, but are faster. Softer wheels are more comfortable and have better grip than harder wheels, on the other hand they are slightly slower and prone to sharp objects such as small stones. The wheels’ hardness is indicated by a number and a letter, for example 87A, where low number signifies softer rubber and high number means higher durometer. The letter indicates the scale of measuring. The shape of wheels influences the grip. Angular edges have better grip in turns and round edges are great for slides. Material composition of the rubber (polyurethane, PVC) and wheels’ cores are also important parameters. Bearings are indicated as ABEC-1 – ABEC-15 … Higher number indicates higher precisiou. Bearings with higher precision level should be faster. Construction and material composition of the bearings is however more important than their precision. If you encounter issues, bearings should be replaced, cleaning the bearings usually has no purpose. When buying new bearing, choose according to the manufacturer’s references and the purpose of bearings rather than depending on their ABEC value.